Canadian home prices continued to tick higher, according to January figures, but on an annual basis, they rose by about three per cent — the smallest increase in almost two years. The Canadian Real Estate Association said Tuesday the average price of a home was $401,143 last month. 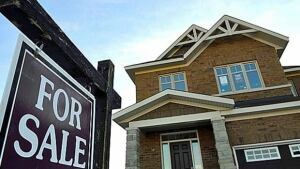 "This represents an increase of 3.1 per cent year over year and the smallest increase since April 2013," the realtor group said. If hot markets in Toronto and Vancouver are stripped out of the calculation, house prices have actually dropped in the past year, with the average price outside those two cities now $312,280, a decline of 0.3 per cent. Demand for housing was especially soft in Western Canada, where the impact of lower oil prices seems to be cascading through other parts of the economy. "Consumer confidence in the Prairies has declined and moved a number of potential homebuyers to the sidelines as a result," CREA president Beth Crosbie said. But just as Toronto and Vancouver seem to be keeping the average price looking higher than it really is, so too is weakness in oil-dependent parts of the country making true demand look weaker than it really is, CREA said. Overall, home sales were two per cent lower in January than they were a year ago. January is typically one of the weaker months of the year for buying homes. But "the decline in national sales largely reflects weakened activity in Calgary and Edmonton," CREA economist Gregory Klump said. "If these two markets are removed from national totals, combined sales activity remained 1.9 per cent above year-ago levels." Housing-market watchers look at something called "inventory" in assessing the health of the real estate market, and there was a slight red flag there, too. Basically, inventory refers to the number of months it would take to sell all the houses currently for sale, at the current pace of buying. There were 6.5 months of inventory across Canada last month, the highest reading since April 2013. I have just downloaded iStripper, so I can have the best virtual strippers on my taskbar.